During the past few months, Kaitlin has been writing an adventure novel with her incredible English “class” called The One Year Adventure Novel. With her love of history, archaeology, and adventure, this class immediately became her all-time favorite. Not only has she been writing an adventure novel, but she is actually living the adventures she is describing in her novel! What a lucky girl! 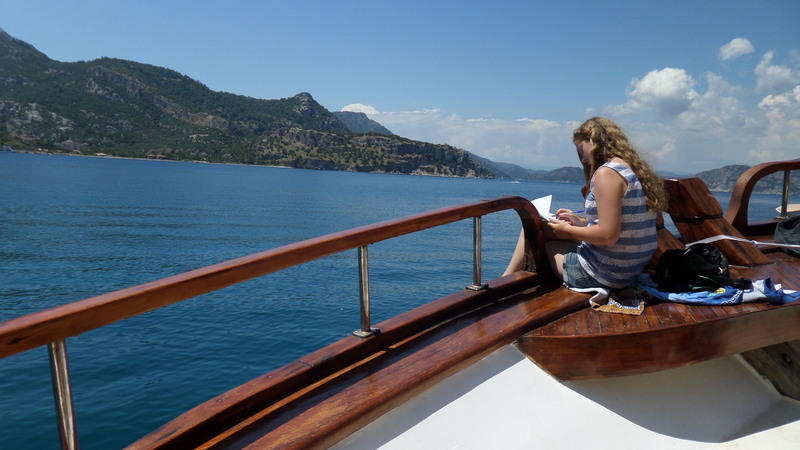 During the past 3 months, Kaitlin’s “classrooms” and inspirations for her novel have included the Hohensalzburg Fortress in Salzburg, St. Peter’s Basilica in Rome, the Acropolis in Athens, several Knights of Saint John castles in Greece and Turkey, the Venetian island fortress turned leper colony on Spinalonga off Crete, the ancient Minoan cities of Akrotiri and Knossos in Greece, the Mausoleum of Halicarnassus in Bodrum, many boat trips to pirate coves and caves and incredible beaches and islands in Greece and Turkey, and many other “creative-idea-inspiring” sights. Combining travel and the One Year Adventure Novel together, Kaitlin’s imagination and passion to write and learn about the past has exploded! I have never seen her so driven to do anything else with such excitement and motivation. She really has found what she loves to do and her mind has opened up to see all the possibilities the world has to offer. It has been so amazing to see how only one school year of traveling and learning with the world as her classroom has enhanced her education and left her excited about learning like never before! Thank goodness for world schooling! Do you have any great world schooling programs or suggestions that have worked for you? Please let us know – we are always open to new ideas! Thanks! Can’t wait to read it. Sorry can’t share any world adventures. Just life adventures with 3 boys! Off to kayak right now with Simon so that will be an adventure!! !